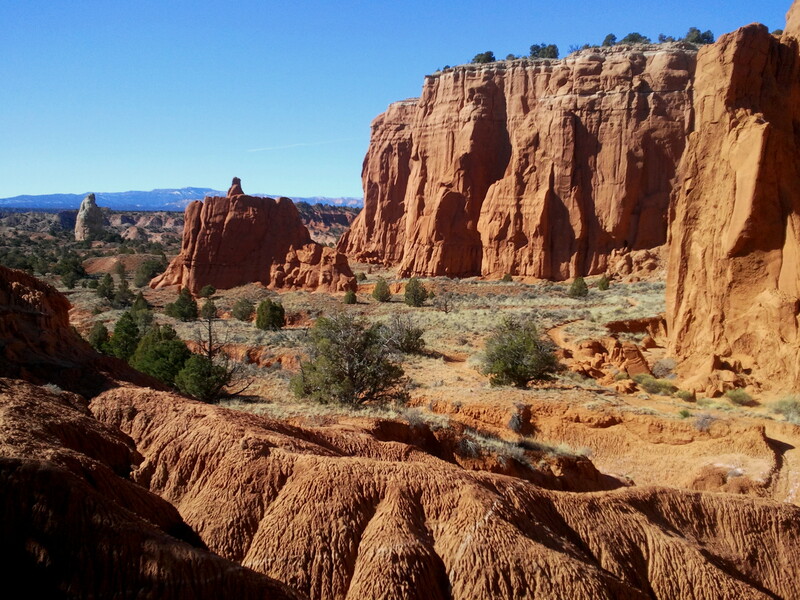 At approximately 50-70,000 people per year, visitation at Kodachrome Basin State Park in southern Utah clocks in at just around 3% of its ever-popular neighbor’s up the road—Bryce Canyon—which absorbs nearly two million visitors annually. Though not as striking as Bryce’s dizzying array of pink and orange hoodoos, the unique landscape of spires and box canyons at Kodachrome is arguably more diverse; seeing the park’s multitude of main attractions can easily consume a full day. For hikers, the park’s 5- to 6-mile Panorama Trail loop comprises the “crown jewels,” packing in more points of interest than any other hike in the park. 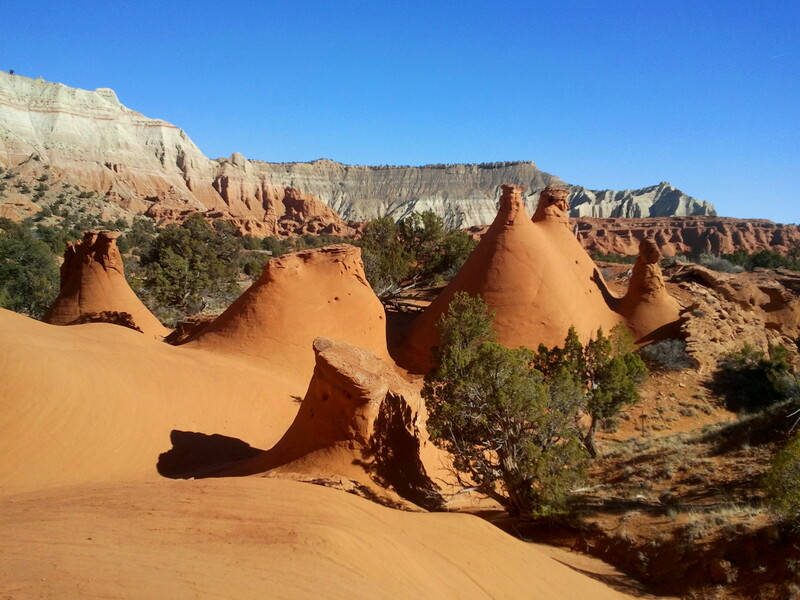 Stops along the mostly flat or gradually-sloping trail include several towering, white-capped spires called “geysers”; the mysterious Secret Passage and Cool Cave; and sweeping views at Panorama Point. A shorter, 3-mile loop is also possible—but skips a number of interesting sights on the outskirts of the route. Allot about a half-day to explore all the different vantage points along the way. 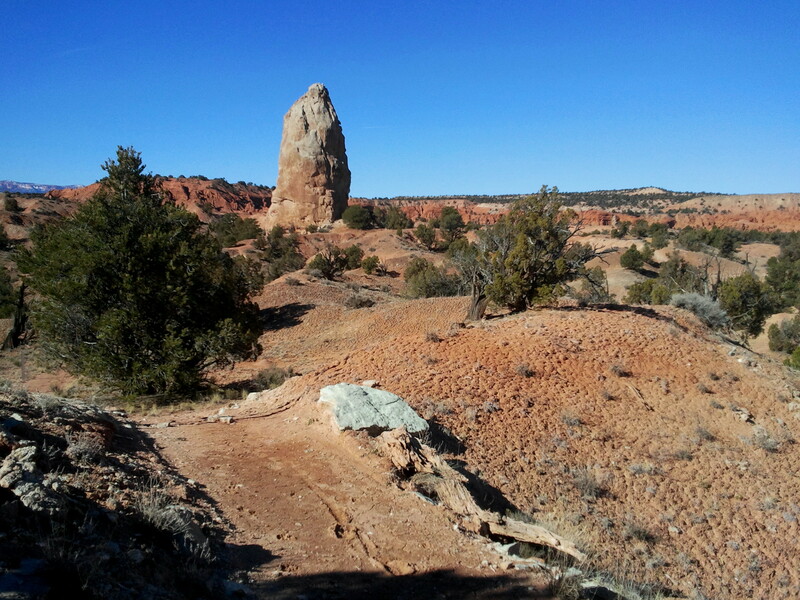 The Panorama Trail begins and ends at the designated parking area on the east side of the road about 0.6 miles north of the Kodachrome Basin Visitor Center. This is also the parking lot for the 1.5-mile Grand Parade Trail, which veers off into the jungle of rocks to the east. For the Panorama Trail, park here then cross the street to the west side, where a wayside sign marks the beginning of the hike. Almost immediately, the wide and sandy trail winds and drops into a rather nasty cut bank. Once on the other side, the trail levels out, climbing only very gradually as it heads west across a flat plain dotted by sagebrush and the occasional juniper. The path is so wide and well-worn that it could almost be classified as wheelchair-accessible—were it not for the ubiquitous sand that would make wheeling a tough slog. 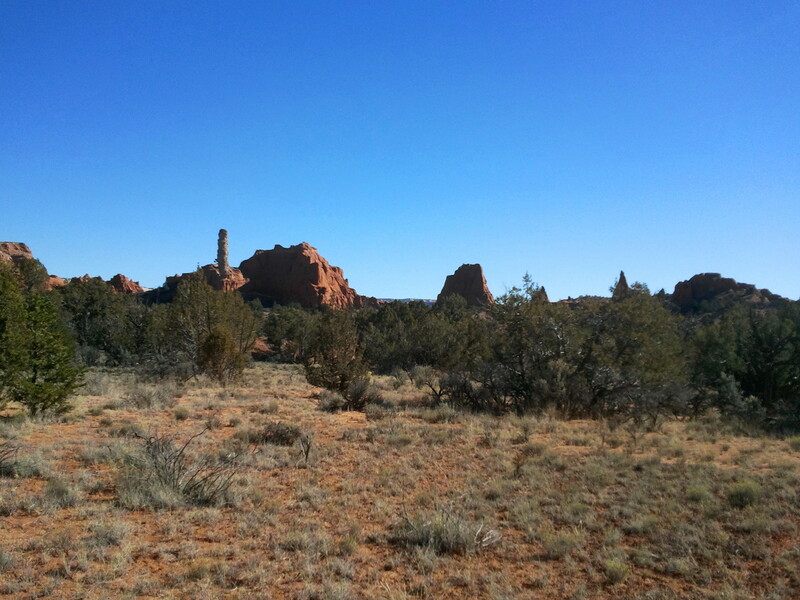 After about ¼ mile, the trail climbs perhaps 25 feet over a small ridge where the first group of three tall spires—you will encounter several dozen along the trail—appear on the right. 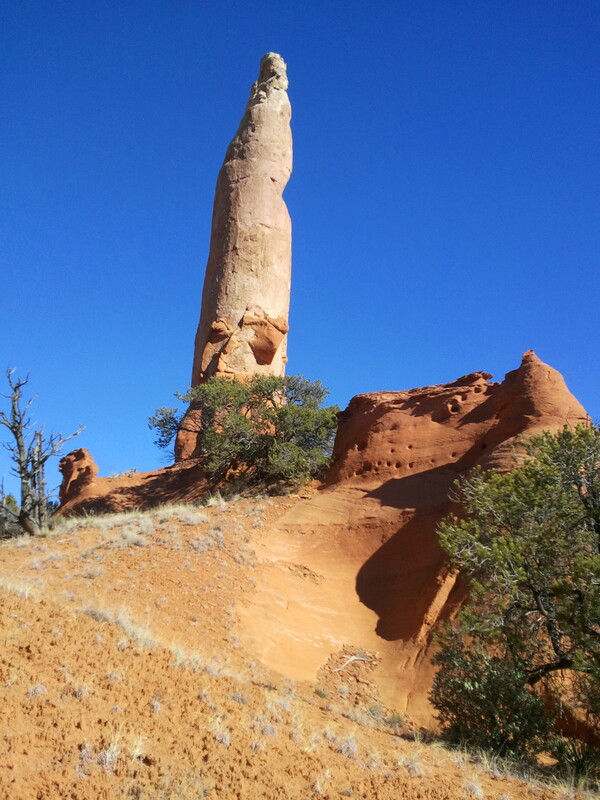 (The closest is called the “Fred Flintstone Spire”.) 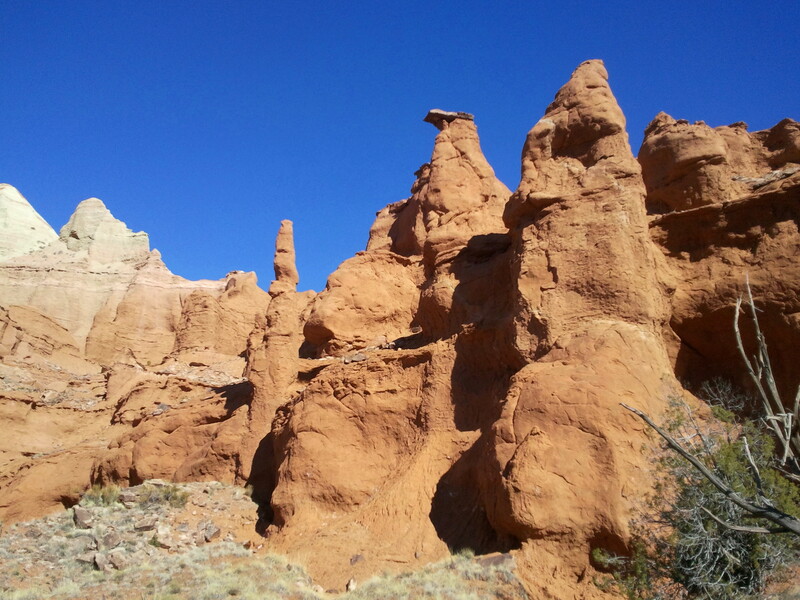 These pinnacles are composed of reddish-orange Entrada sandstone, the dominant rock layer of Kodachrome Basin (as well as that of the more-famous Arches National Park). 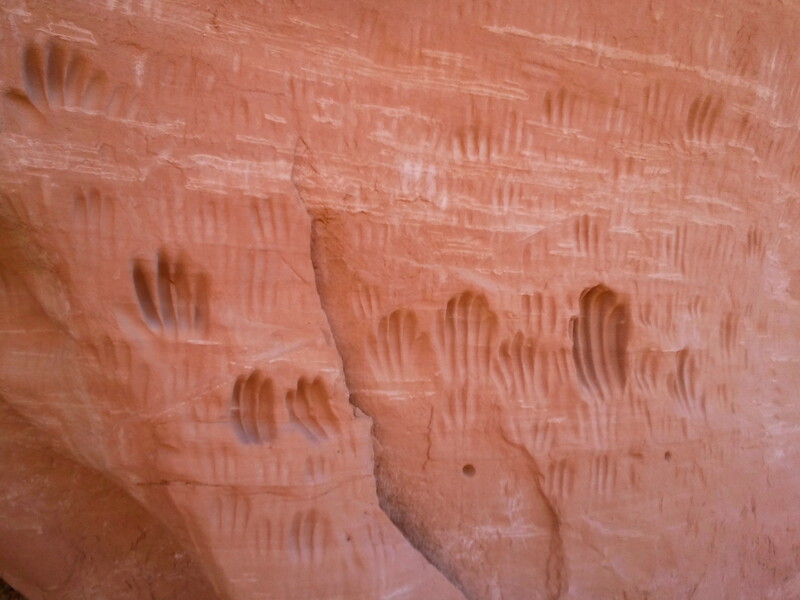 Bearing left at the trail fork, the Panorama Trail traverses two dry wash beds as it heads toard two large Entrada buttes. Living biological soil crust—also known as cryptobiotic soil—flourishes along the gentle slopes between the two cut banks. A little over a half-mile from the first trail fork, the route diverges again. Take a left at the marked sign for the short detour to Panorama Point. The 0.2-mile spur trail to Panorama Point weaves between the two large buttes and reveals a third ahead. The path climbs about 100 feet up the latter; a sign (dismantled when I was there) marks that you have reached Panorama Point. Aptly named, the overlook offers vistas in all directions, with only a small sliver of the horizon blocked by another hillside to the south. In the distance off to the west, notice the thin white-to-pink line of cliffs; this is Bryce Canyon National Park. To the north, you can trace much of the terrain covered by the Panorama Trail, including a conspicuous, white pinnacle known as Mammoth Geyser. Beyond, the Grey Cliffs tower 800 feet over the basin. 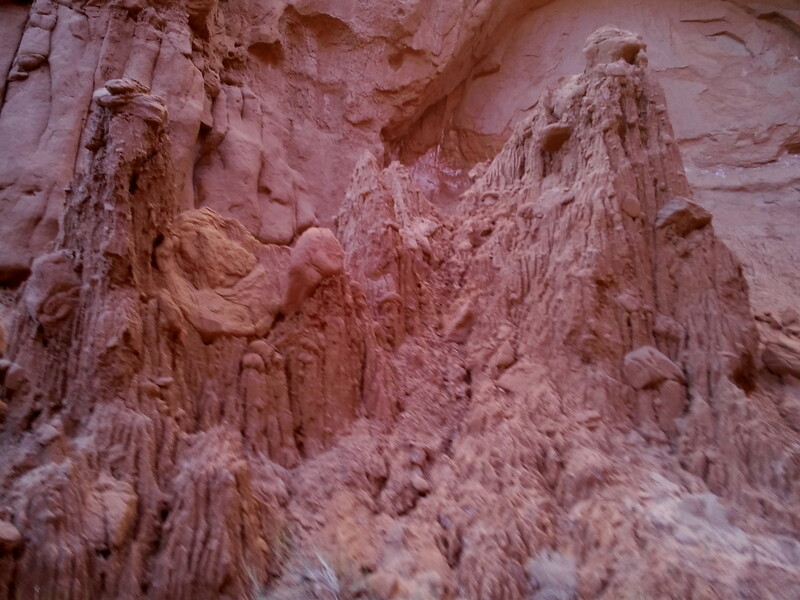 A look to the east reveals a hillside of faded pink badlands composed of the Winsor Member of the Carmel Formation. 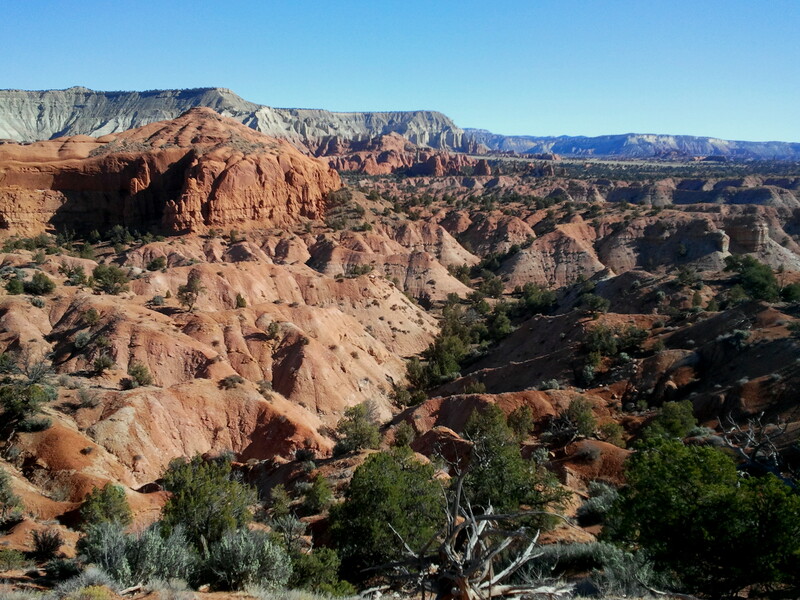 To the south, the broad expanse of the 1.9 million-acre Grand Staircase-Escalante National Monument, a maze of sweeping cliffs and deep canyons that is a hiker’s dream. From Panorama Point, return the 0.2 miles downhill to the trail junction; turn left, heading north. The route is mostly flat for 3/10 mile, at which point there is another unmarked fork. Bear left. Within another 1/3 mile, the trail passes to the right of Mammoth Geyser, the tallest and thickest of the “sedimentary pipes” encountered on the hike. There is a short spur trail that leads to the base of the rocky promontory. Another 150 yards up the trail, the Cool Cave trail splits as it crosses a dry wash. A signpost spirits hikers off to the left—the most direct route to Cool Cave. 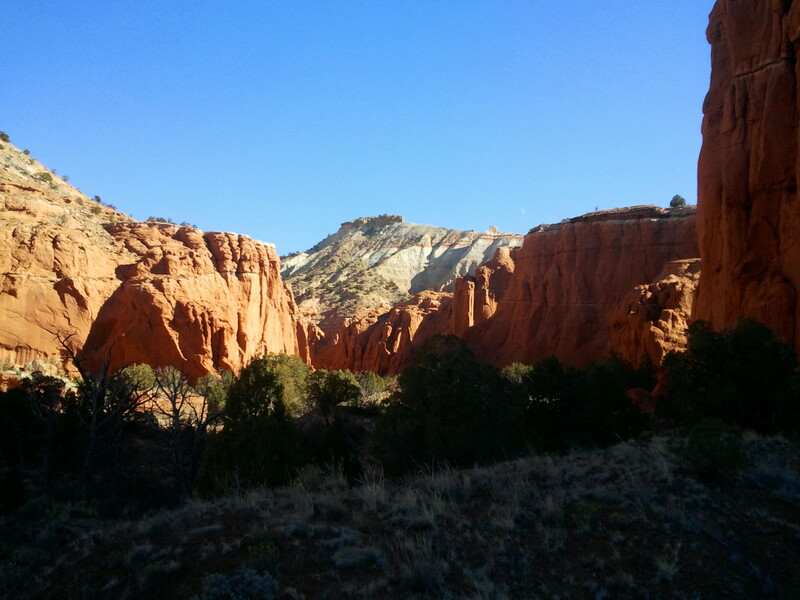 From here, the left fork makes a beeline for the red-orange cliffs. 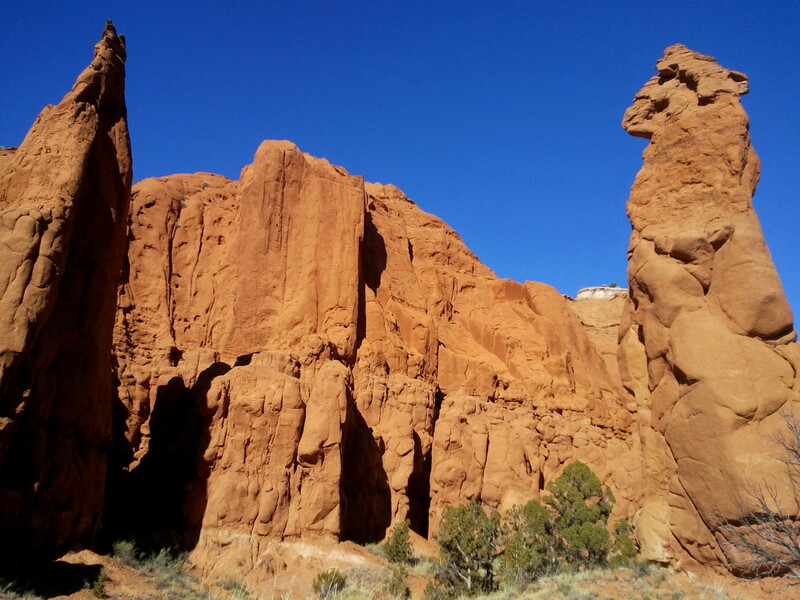 As the path approaches the Entrada walls, it passes between two tall spires that stand like sentinels guarding the entrance to Cool Cave. The actual turnoff to Cool Cave is 0.1 mile farther; a sign directs hikers to turn left. From here it is about 150-200 yards to the attraction itself. 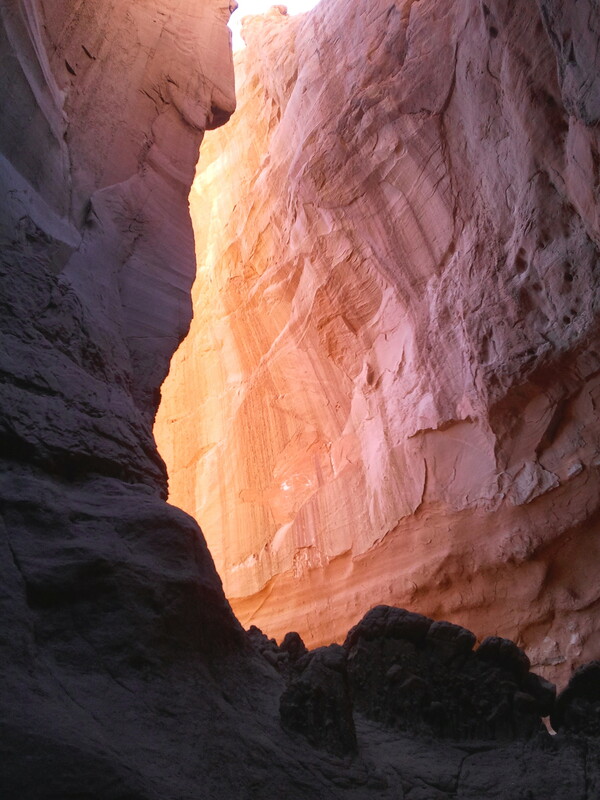 Cool Cave is more of a cove than a cave and in some ways resembles a classic Utah slot canyon—a narrow traverse between colorfully-lit walls. Follow the muddy wash bottom up and around a bend—the only real obstacle, a 4-foot pouroff, is easily climbed. The mini-canyon ends in a shady alcove; an impassible dryfall rising above is sure to form an impressive waterfall during summer flash floods. Though this is not an enclosed cave, two bubbling globs of sandstone on the left-hand side curiously resemble cavern-like stalagmites. Chilly Cool Cave offers brief but welcome solace on a hot summer day. Upon exiting Cool Cave, turn left at the “Cool Cave–>” sign to continue the 1.1-mile loop. The trail follows the craggy sandstone cliffs for a half-mile, passing a number of tempting side canyons along the way. Near the end of the loop, a tiny rock arch is visible near the top of the 300-foot cliffs. From here it is about 0.2 miles back to the point where the Cool Cave loop splits and another 0.1 miles to the main Panorama loop. It’s not entirely clear what the “Secret Passage” is, but my best guess is the spot where the trail climbs up and over a small slickrock divide between the high cliffs and a collection of oddball, teepee-looking rocks. 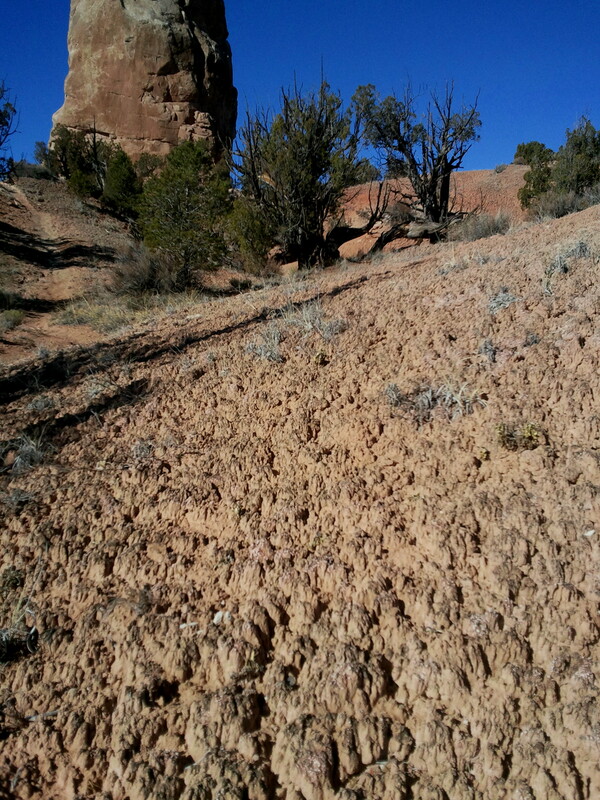 These photogenic spires (which I suppose also look like massive anthills) are composed of smooth sloping in the Gunsight Butte Member of the Entrada formation. 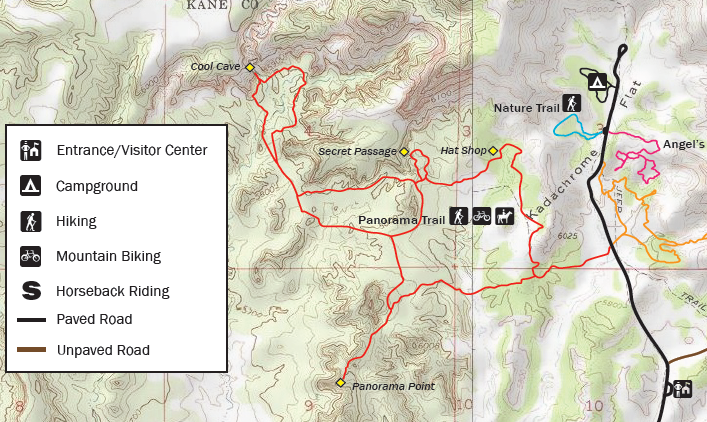 The spur loop to Secret Passage is poorly-marked and hard to follow, but basic orienteering will bring one back to the main Panorama loop at the end of the 10-minute detour. A few minutes’ walk down the trail, the route passes directly to the left of a 9-foot spire, one the park’s shortest but easily the most accessible. 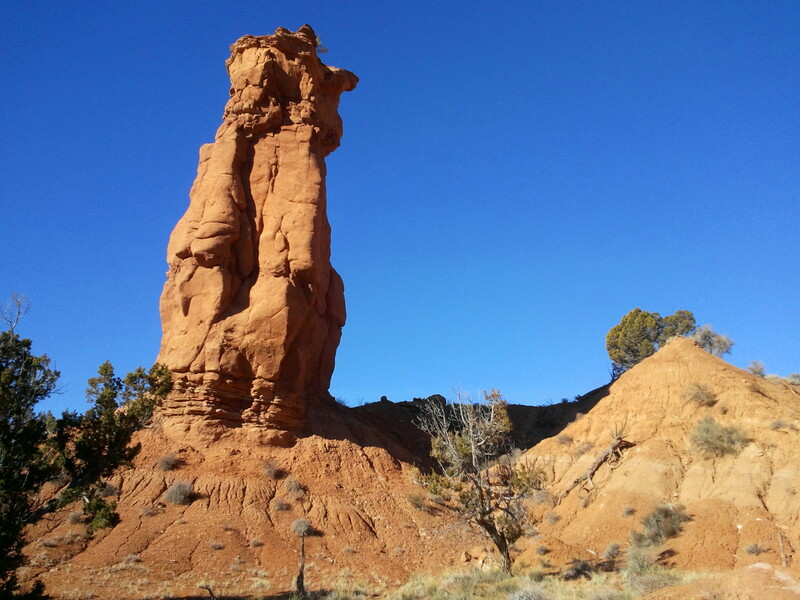 The next marked destination is the “Hat Shop,” a collection of peculiar hoodoos, at least one of which looks like it is topped by a ball cap. 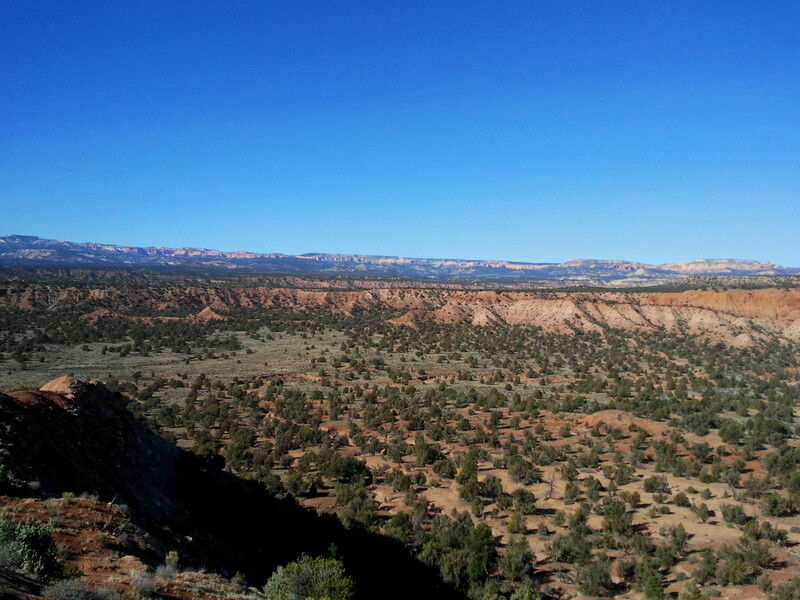 The viewpoint offers a nice look as well of the steep white cliffs above, composed primarily of the Escalante Member of the Entrada and capped by strips of newer Henrieville and Dakota sandstone. 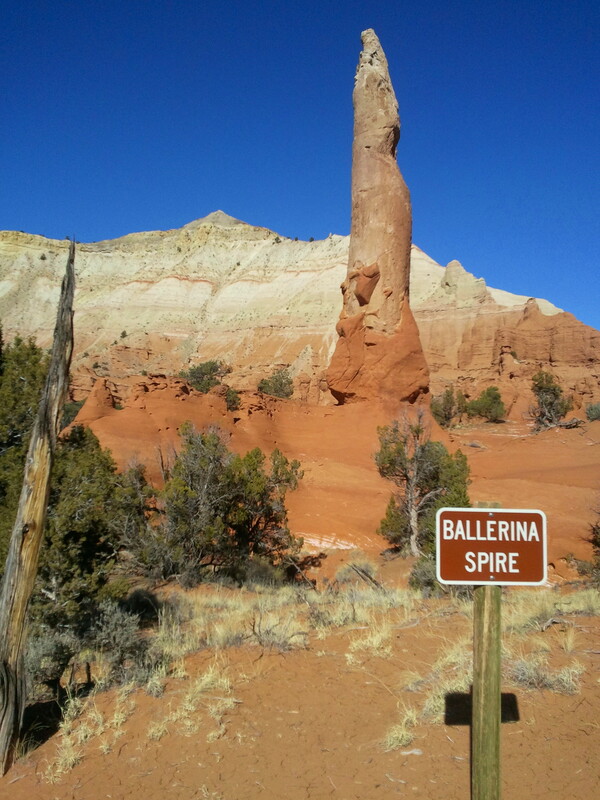 Just beyond the Hat Shop is Ballerina Spire, certainly one of the highlights of the hike. The gray, narrow pipe reaches high into the sky, dwarfing all other rocks and trees around. Here it is easy to posit a whimsical story of a gushing geyser 70 feet high, suddenly and instantly turned to stone. From this spot, it is a little over ¼ mile to the final trail junction, where a left turn brings one back down the original ridge from the beginning of the hike. 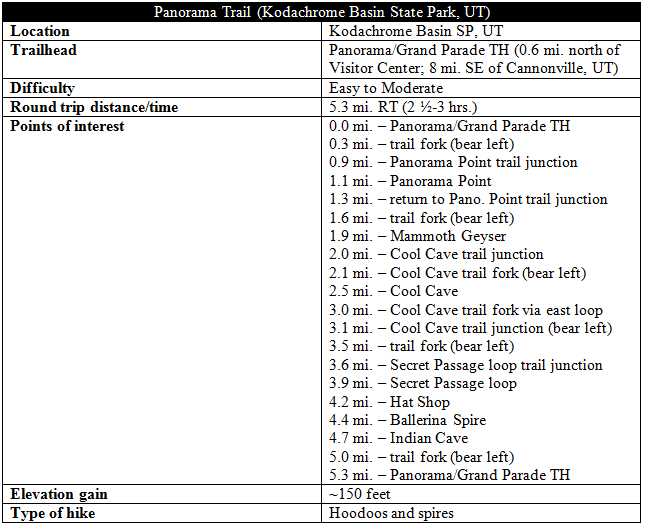 Before you know it, you are back at the trailhead, completing the 5.3-mile loop hike through some of Kodachrome’s most interesting territory. Allot at least 2 ½ miles for this interesting hike, or more for the photography- or exploration-minded. This entry was posted in Kodachrome Basin State Park, Moderate Hikes, Utah and tagged Ballerina Spire, Big Bear Geyser, Bryce Canyon, Cool Cave, Entrada sandstone, Hat Shop, Indian Cave, Kodachrome Basin, loop hike, Mammoth Geyser, Panorama Point, Panorama Trail, Secret Passage, sedimentary pipes, spire, Utah. Bookmark the permalink.